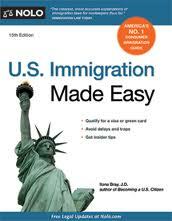 U.S. Immigration Made Easy covers every possible way to legally enter and live in the United States. The author explains how the immigration system really works, showing you how to qualify for: • work visas • student visas • refugee status • green cards • citizenship • and more Step-by-step instructions show how to fill out and file forms and how to approach the enormous USCIS bureaucracy. Thoroughly updated and revised, the 12th edition covers the latest legislation, and provides new information to help you understand your rights and protect your applications from bureaucratic hassles. It also shows you where to find the most up-to-date forms you need on the Internet. US Immigration was a great cpe course. The materials arrived quickly and the test was graded the same day.